Supporting vibrating wire sensors the dataTaker DT80G GeoLogger is ideal for all geotechnical data logging applications. The dataTaker GeoLoggers have built-in vibrating wire support providing ideal data acquisition and monitoring solution for the engineer working in the geotechnical environment. The low cost, low power dataTaker DT80G is extremely versatile and easy to configure for communications, data capture and data analysis. View the data in real time or store up to 5 million data points. Data storage and retrieval can be achieved via USB memory stick, FTP, cell phone, Modbus for SCADA, Ethernet or Web. The dataTaker GeoLoggers can monitor a wide variety of geotechnical datalogging applications including slope stability, subsidence, dam wall monitoring, tunnel and mining excavation, ground water, tunnel wall monitoring and site assessment. The dataTaker DT80G has 5 analog channels capable of measuring up to 5 vibrating wire strain gauges with thermistors or 15 vibrating wire strain gauges without thermistors. If additional channels are required the dataTaker DT85G has 16/48 vibrating wire channels. The DT80G and DT85G can be expanded simply by connecting dataTaker Channel Expansion Modules (CEM20) to provide 100 to 300 vibrating wire channels with thermistors. The advanced new dataTaker DT80G range Geologgers are compatible with all major brands of geotechnical instrumentation including Slope Indicator, RST Instruments, Geokon, Soil Instruments, Roctest, AGI – Applied Geomechanics Inc. Manage a variety of sensors or devices using the Sensor Power options via dedicated power output, digital outputs or the latching relay configurations. Store up to 10 million data points in user defined memory, log as much or as little as you need with independent control of schedule size and mode. Overwrite or stop logging once allocated memory is full. Archive data on alarm event, copy to USB memory or transfer via FTP, the choice is yours. Communications features include RS232 with modem support, USB, Ethernet and USB memory stick ports. Connect to the DT80 locally, remotely or over the Internet. 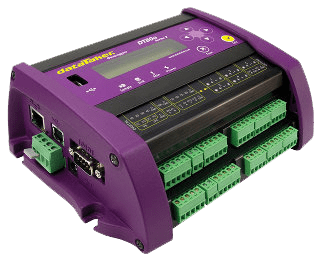 The web interface allows users to configure the DT80G, access logged data and see current measurements as mimics or in a list using a web browser. FTP provides data to your office over the internet or mobile phone network, without the need for polling or specific host software.